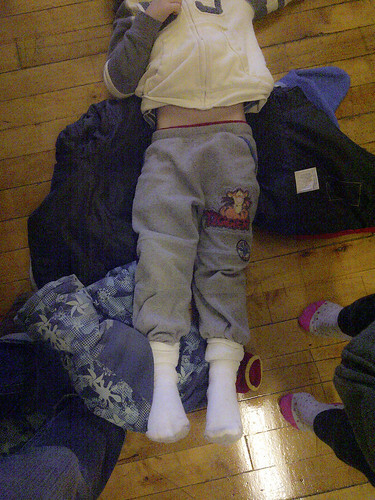 CJ’s big problem: He doesn’t want to wear snow pants because they make his pants slide up his leg. And it’s snowing! And we’re late for the bus! 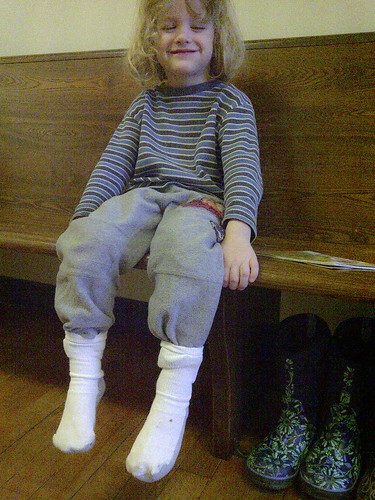 Mama’s quick solution: Tuck pants into socks, and we’re good to go. But Mama wonders, will the kid figure out how to tuck his pants in again at school? After all, he has to dress himself in snow clothes for two recessess, plus coming home after school. Apparently, Mama needn’t have worried. He knew what to do! He just wore them tucked in all day long. Like this. Yep. It’s a good look. Today’s post is all about practicalities. Sorry, folks. I’m going to post my kids’ Christmas wish lists here. If you’re an aunt, uncle, or grandparent, you may find these interesting, even helpful. If you’re anyone else, please accept my apologies, and check back tomorrow instead. There is no ninth request, but he wrote the number down, just in case. I will just add, although not on every list, that books, puzzles, games, crafts, and creative off-the-wall toys are always welcome, and will please the children too. And I’m not just saying that! Should I make a Christmas/birthday wish list? Ah heck, why not. – there must be more, but I’m blanking. No Skylander figures (or figeuers, or figeirs, or even figrers) for me, please. Carrie, my wish list is almost identical to yours, except I said GC to Running Room so that my dad could still purchase that for me in BC. How can you tell we are seasonal eaters?! She didn’t get a few fruit items for her birthday and is hoping to this time around: I’m pretty sure papaya and blood oranges are high on her wish list. Maybe not if you’re 11? Oh, what a great post, made me laugh (and cry from laughing! ), it might be a little late for this aunt/sister who is almost DONE but some good tips as I finish up! We need to see K’s list of course!! What are the chances I’ll convince Kev to make a list?? ?